The Tempe Diablos have been doing GREAT things in Tempe for over 40 years. I vividly remember stories from when I was a little kid living in Tempe of my uncle telling us about the organization he has been a part of since longer than I can remember. To be clear, Casino Capers is about MUCH more than just a GREAT party. It’s about changing the lives of people in our community. Tonight is the annual Casino Capers fundraising event that has become a “can’t miss” for many people. If you want to have a LOT of fun, eat some great food, and hang with some of the “cool kids” in the neighborhood, you need to have this annual event on your radar. The 2014 Casino Capers event is really something you should come and see for yourself. Tickets for Casino Capers are just $250.00 per couple. I can assure you, it is money well spent. This event is top notch, the silent and live auctions are something you don’t want to miss. Please don’t let my wife bid on a “cute” puppy this year! Give back to our great city, have some fun, and meet some great people. 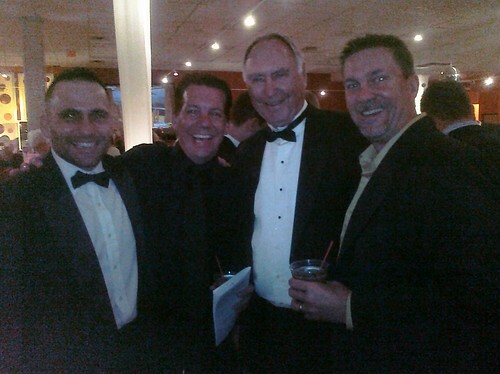 Michael Monti, Jack Smith, Jim Mack and Nick Bastian – 2010 Casino Capers. Lori and I hope to see you there!